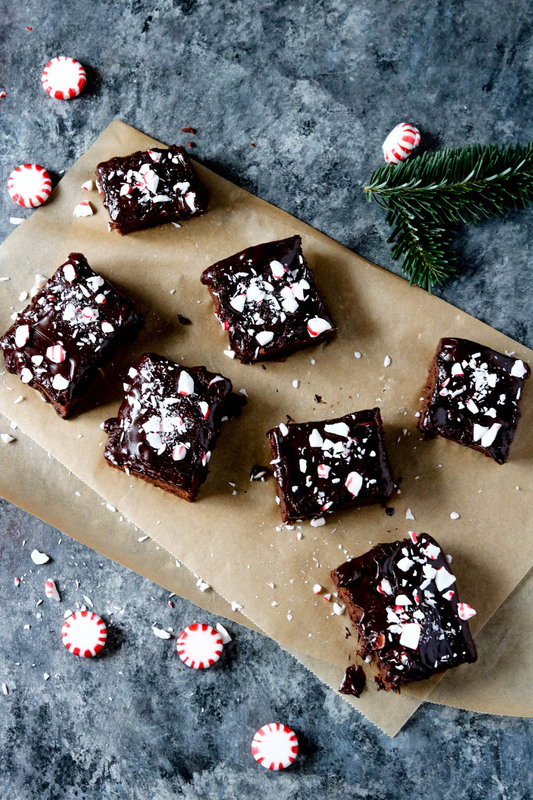 Peppermint sweet potato brownies with dark chocolate ganache, yes, you heard me right. The sweet potatoes give these brownies and nice, fudge-like dense texture and the crushed peppermints on top give these just a hint of mint without overpowering the flavor. And no, these do not taste like eating a sweet potato so the kids will still eat them and not even realize they’re getting beta carotene and other nutrients! I’m not a huge peppermint fan but since it’s Christmas time I was feeling a little festive and wanted to bedazzle these brownies with a little extra flavor. Sometimes dark chocolate ganache can be overpowering so the cool flavor of the peppermint helps balance the two flavors. 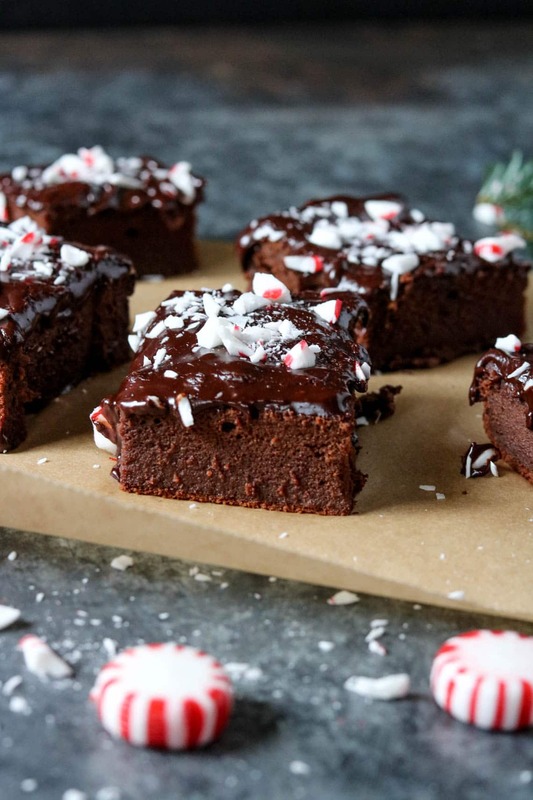 Brownies are traditionally more dense than cake, but with these peppermint sweet potato brownies the sweet potatoes create an even more dense texture, and it was perfection! 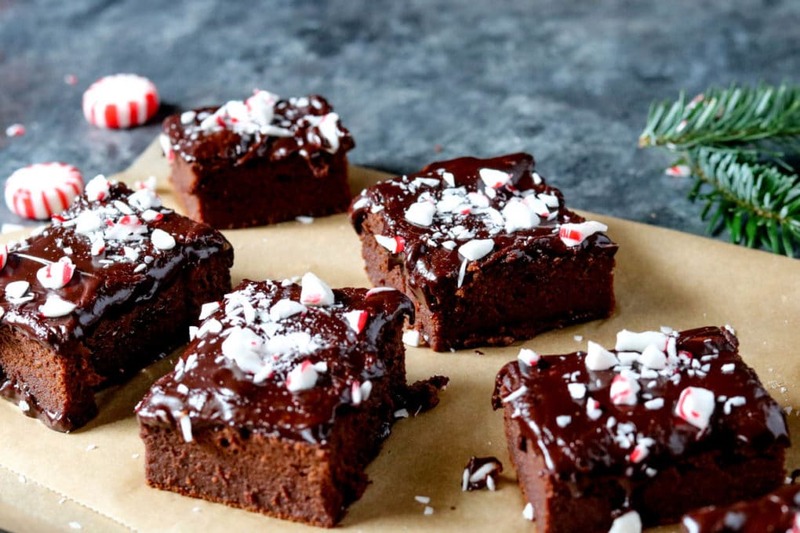 Serve these up to the kids, take them to work, or bring them to Christmas dinner and wow them with this healthier alternative to a traditional treat. Make it fun, don’t even tell them they’re made with sweet potatoes and see what they think! Preheat oven to 350 degrees F. Grease an 8×8 baking pan with coconut oil. Using a fork, poke holes all over the sweet potato, wrap in a damp paper towel and microwave for 6 minutes. Rotate, cook for another 6 minutes. Continue until soft and cooked through. Scrape the flesh out of the sweet potato into a 1 cup measuring cup. Add the sweet potato flesh, eggs, coconut oil, honey, and vanilla extract to a food processor and process until smooth. Add in the gluten-free flour, cacao powder, salt, and baking powder. Process again until smooth. Remove the brownies and set aside to cool. In a small saucepan, add the coconut milk and chocolate chips and heat on medium-low, stirring continually, until thoroughly melted and mixed together. Using a rubber spatula, spread the ganache over the top of the brownies. Place peppermint candies between two sheets of parchment paper and, using a blunt object, lightly smash until crushed. 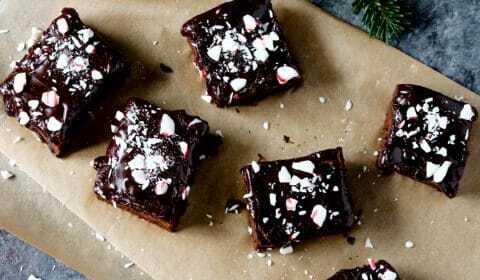 Sprinkle crushed peppermints over the top of the ganache. I love that you are using sweet potato in these! Yum!